Those who have used GNU+Linux know the very useful select-to-copy and middle-click-to-paste feature, which has grown to a habit. This feature is very much used when browsing. We just select a string and middle-click paste it into the search-bar, or somewhere else. Microsoft Windows do not support this feature. But the good news is this select-to-copy and middle-click-to-paste feature can be enabled in Firefox under Microsoft Windows. Read the following simple guide to know how to unlock the Windows Firefox select-to-copy and middle-click-to-paste feature. Firefox has a treasure hidden in its own configuration structure which can be thought like the Microsoft Registry. We will edit just one configuration here. You will see a warning. Click the “I’ll be careful, I promise!” button. You will see a lot of text written in the next page. Type in “middlemouse.paste” in the filter bar on the top, and you will end up in one entry. The Value of this “middlemouse.paste” Boolean (true, or false) entry is false. Double click this entry to make it true. Or right click on the entry and click Toggle. This will enable the paste function when you click the middle mouse button in firefox. Now start surfing with the select-to-copy and middle-click-to-paste feature in Firefox under Windows. There are two more such configurations one is “clipboard.autocopy” . This is set to false in Microsoft Windows version of Firefox by default, and true in GNU+Linux by default. Setting this to true copies text automatically when selected. Although this function in Windows does not work. 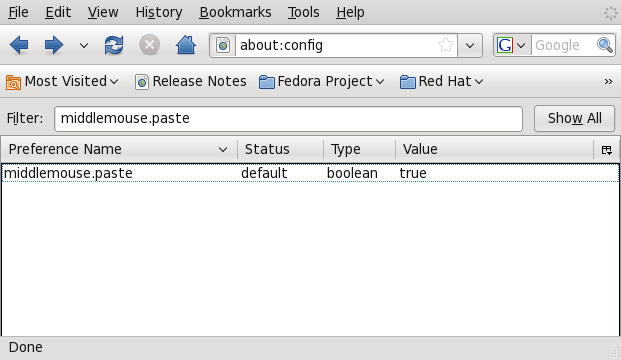 But works fine in GNU+Linux and you can disable this select to copy feature in GNU+Linux. Another one is “middlemouse.contentLoadURL” . If this controls if a URL is copied, then a middle click will load the URL. This is default to true in GNU+Linux and false in Windows, although this feature then changed to true does not work in Windows. This is a cool feature. I have always wanted to be able to do this. Now if we can get Apple or Microsoft on board to enable this feature for our personal machines . . . Thanks, I’ve been really missing the middlemouse.contentLoadURL since they turned it off be default in Linux. Remember to make “middlemouse.paste” to false before using the AutoCopy plugin, else middleclick will paste twice. –thank you very much for helping me solve a long term annoyance. Very important thing to do. I noticed this when testing the plugin, and figured out that the finrefox’s internal paste should be disabled. AutoCopy is great, except it doesn’t seem to work in the address bar. I haven’t found any useful tool for middle mouse copying in other applications. TXmouse breaks most of the other uses of middle mouse button, e.g. you can’t open links in a new tab with middle mouse anymore. It breaks other things too, e.g. the context menu on bookmarks will disappear when moving the mouse. At last! Someone who understands! Thanks for ponstig!